Though his family hailed from New York, Matthew Ridgway spent his retirement years in Pittsburgh, heading the Mellon Institute and creating an intellectual presence in western Pennsylvania. In whatever he did in life, Ridgway made his presence known. "The force that emanated from his was awesome," recalled one of his subordinates. "It reminded me of Superman. You had the impression he could knock over a building with a single blow, or stare a hole through a wall, if he wanted to. It was a powerful presence. He'd come into a room and you immediately felt it." Matthew Ridgway was born in Fortress Monroe, Virginia, where his father, a colonel of artillery, was then stationed, in 1895. Following in his father's footsteps, Ridgway graduated from West Point in 1917. Instead of going to fight in Europe, he went to Texas, then back to the Point as instructor of Romance languages and director of athletics. During a tour of duty in China in the 1920s, Ridgway came into contact with future general in chief George C. Marshall, who was quite impressed by his character; thereafter, Ridgway became one of the general's "boys." Fluent in Spanish, he accompanied Marshall on a trip to South America just before Marshall began his term as Army Chief of Staff in 1939. 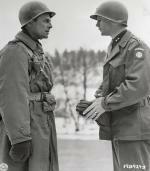 As the army began to grow under Marshall's direction, Ridgway found himself promoted to Brigadier General in early 1942 and assigned as assistant division commander to Omar N. Bradley, commander of the reactivated 82nd Infantry Division. This unit began to assemble at a camp in Louisiana, where 2,000 men from the 9th Division formed the cadre, or core, of the new division, to which 16,000 draftees were assigned. To Bradley and Ridgway came the task to whip this new division into fighting trim. The generals were making good progress when in June, to everyone's surprise, Bradley was reassigned to command of the 28th Division, a Pennsylvania National Guard division that was progressing slowly. With Bradley's departure, Ridgway was promoted to division command. The Germans' use of airborne troops to capture Crete in 1941 had prompted the U.S. Army to closely examine the possibility of creating its own airborne force. In early August 1942, Ridgway received unexpected orders that converted the 82nd into an airborne division. The existing division would be split to form the 101st Airborne Division, with both units then filled with more draftees. Ridgway assembled the 82nd and announced the War Department's decision on August 15. "There were sixteen thousand men standing there," recorded an observer, "and you could have heard a pin drop. And when Ridgway explained that four glider regiments would be formed from the ranks of the regular infantry, I saw a lot of faces go white." Confusion reigned for the next few weeks as the divisions were formed, men transferred, draftees inducted, and thousands of men transferred who were afraid of heights, got airsick, or wanted out of the airborne units. Ridgway, together with the rest of his men, had to learn all about airborne operations, something completely new in the American army. The two divisions moved to Fort Bragg, North Carolina, and began to undergo an intense program of airborne training. By nature an aggressive commander, Ridgway jumped out of airplanes and trained with his men. Leading by example, and never from behind the lines, Ridgway would prove to be an excellent choice for airborne operations. Indeed, one of his subordinates, Jim Gavin, called him a "great combat commander. Lots of courage. He was right up front every minute. Hard as flint and full of intensity, almost grinding his teeth with intensity so much so, I thought: that man's going to have a heart attack before it's over." 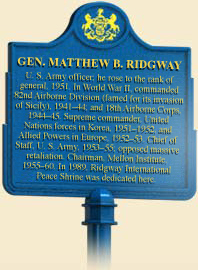 The 82nd's baptism by fire came in July 1943, when elements of Ridgway's division were dropped behind German lines in Sicily to disrupt German attacks on the American landing zones, where George Patton's troops stormed ashore. This first American airborne operation was not without problems. Most of the paratroopers missed their targets. But, as luck would have it, the presence of widely scattered groups of Americans made the German armor attacks toward the beachhead move cautiously. On more than one occasion, paratroopers repelled German and Italian attacks and managed to hold their positions in time to be relieved by Patton's troops. After some fighting in Italy, both American divisions were moved to England to take part in Operation Overlord, the June 1944 invasion of France. Ridgway and Maxwell Taylor (commander of the 101st) both dropped behind the beaches on the night of June 5, and took part in coordinating their scattered units, holding German counterattacks at bay until relieved by units pushing inland from Utah Beach. The intense fighting in and around the French town of St. Mere-Eglish produced forty-six percent casualties in the 82nd, prompting a much-needed rest and refitting. In August 1944, General Eisenhower formed the First Allied Airborne Army, bringing together British, Polish, and American airborne units. Ridgway was promoted to command the XVIII Airborne Corps, composed of the 82nd and 101st, plus the newly arriving 17th Airborne Division. Gavin received command of the 82nd. Ridgway thus directed the two veteran American divisions in Operation Market-Garden, the failed attempt by British commander Bernard Montgomery to use the airborne troops to seize key bridges from Allied troops advance across the Rhine River in Holland. Ridgway continued to lead the corps through the rest of the war, fighting during the Battle of the Bulge and in the push across the Rhine into Germany. 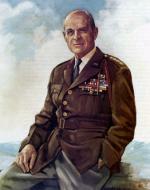 Following the war, Ridgway led the 8th Army in Korea, then took command of United Nations forces there after President Truman sacked General Douglas MacArthur in 1951. In 1952 he went to Europe to command NATO forces, then served as army chief-of-staff (1953-55) for two years before he retired at age sixty. Ridgway then moved to Pittsburgh, where he became director of the Mellon Institute for Industrial Research. In 1988, the University of Pittsburgh opened the Ridgway Center for International Security Studies to honor the general's contributions to America. In 1993, General Ridgway died at the age of ninety-eight at his home outside Pittsburgh. Robert C. Alberts, "Profile of a Soldier: Matthew B. Ridgway," American Heritage 27 (February 1976): 4-7, 73-82. Clay Blair, Ridgway's Paratroopers: The American Airborne in World War II (Garden City, NY: The Dial Press), 1985. Matthew B. Ridgway, Soldier: The Memoirs of Matthew B. Ridgway (New York: Harper’s), 1956.